Just a quick encouragement for you to go climb every mountain you can.You never know who (or what) you might meet at the top…. 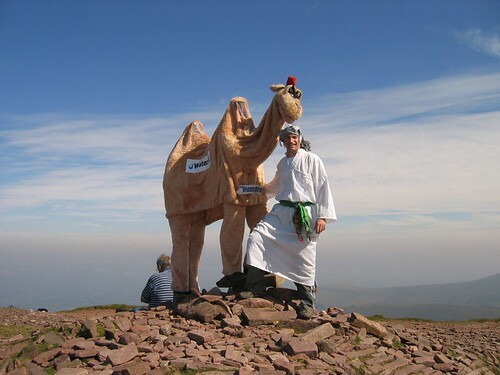 THE sight of a camel on the summit of Pen-y-fan did not seem particularly unusual. These are hardy animals, cousins of the llama, which we know enjoy high altitude life in the Andes. 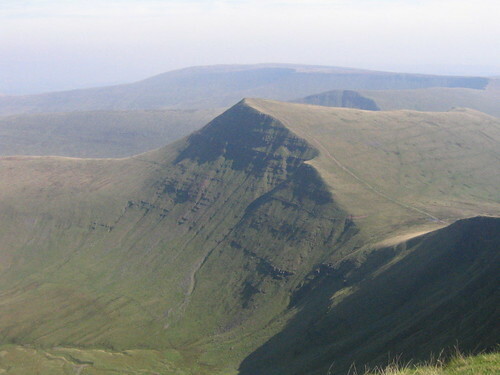 And the top of a peak in the Brecon Beacons is a place where it should not be that surprising to see anything. It is a location you do not go to by accident but by choice and following a modicum of preparation – finding a camel in the bath would be truly odd. But when this camel moved in the blasting sunshine it seemed to have human legs. At such moments you begin to wonder if you are in the throes of a hallucination and suffering from a salt deficiency. But as the camel came nearer its lower half did not look less human. Like an inverted centaur, here was a creature that appeared to be the missing link between the noble transportation device of the Bedouin and you and me – alive in the wilderness of Wales! Yet such a revelation was not coming my way, alas. A South African chap in some Lawrence of Arabia garb dashed up and explained that his two friends had put on a camel suit and climbed a few peaks that day to raise money for the thoroughly noble charity, Water Aid. Perhaps it was best there was no meeting with a real camel, or even the more plausible llama. It was a hot day and it may well have been irritated by media attention. As I pottered down the shingle-laden path and worried about sunburn, I thought, actually, the presence of presumably affluent human beings dressed up in a camel suit on a sweltering day in the hope that this absurdist act may somehow lead to a village gaining clean water is more astonishing, surreal and marvellous than the sighting of any dromedary. Here was a valiantly anti-Darwinian gesture of compassion and imagination: it’s not enough that the fit survive – to be human is to recognise a connection with the physically weakest of our species, knowing there is something eternal in each of us which is not defined by flesh and blood. For some reason the hawthorn trees were blazing with more red berries than would normally be considered feasible. They glowed like the lights on a Las Vages Cinema. It’s an incredibly strange but fantastic thing to be alive. On a sunny day in the Brecon Beacons the mind boggles at the beauty lavished on our world.